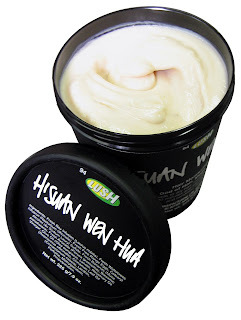 I'm a big fan of Lush and was sent their H'Suan Wen Hua Hair Mask to try. Whilst the name is a bit of a mouthful (supposedly Cantonese for "The God of Hair"), the pricetag is a bargain at £7.99 for a generous 225g tub. Presented in one of Lush's signature black tubs, the packaging isn't exactly glamorous yet whilst I still feel that the brand's black tubs could do with some improvements, I do like that they offer a free fresh face mask (Catastrophe Cosmetics is my personal favourite) when you return five empty pots to the store. The scent is very much a "love it or hate it" strong, spicy aroma which luckily, I found warm, exotic and soothing although I'd definitely recommend trying it before buying as it won't be to everyone's liking. The mask is packed with all of the hair-loving ingredients that you'd traditionally use to make a home treatment, such as fresh free range eggs, organic bananas, avocado and extra virgin olive oil & I really liked this foodie element. It has a thick texture which I liked as it wasn't messy & didn't drip upon application. Per the instructions, the mask should be applied to dry hair for 20 minutes before washing, which is a fairly lengthy wait but makes for an enjoyable weekend treat. As it's a pre-shampoo mask, I didn't have any issues with rinsability- definitely a plus point! After use, my hair was left feeling healthy, thickened & stronger. Despite being a thick mask, my hair wasn't weighed down although I was left feeling a little disappointed at the lack of shine (particularly as shiny hair is generally associated as being healthy). Overall, I was impressed with the conditioning benefits. Even when being generous with application, I'd say you'd get at least half a dozen uses from the pot for medium length hair and being such an intense treatement, I wouldn't say it's necessary to use more than once every week or so- a fab value for money option! I agree with you about the Lush tubs, they are in desperate need of a makeover!